And here are some pictures of the last few shirts I’m making for a while – I need to get back to the rest of the house! I have had a lot of fun making them, and I think they have a unique and retro feel that’s very cozy. Again, I got the shirts and dresses from Rock Bottom T-Shirts, which seems to have the best prices around for blank items. I made these for our baby, when I was preparing for the baby shower. I wanted them as examples of designs people could try, and I chose gender-neutral patterns, since we don’t know if Nicola and Victor are having a boy or a girl. 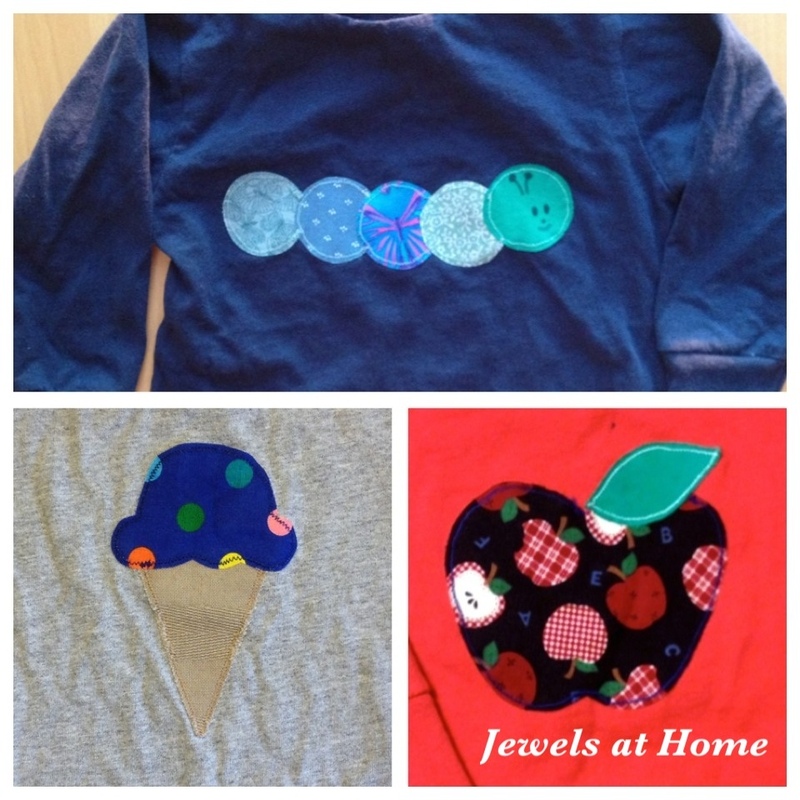 More ideas for kid’s appliques. I tried to make designs that would work well for boys and girls. 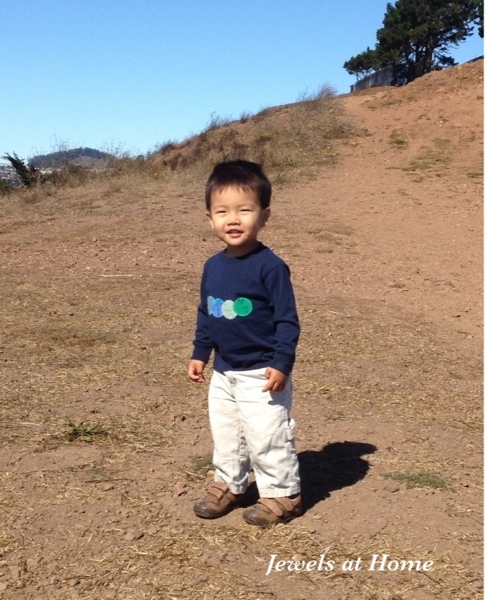 Baby J sporting his DIY caterpillar shirt. 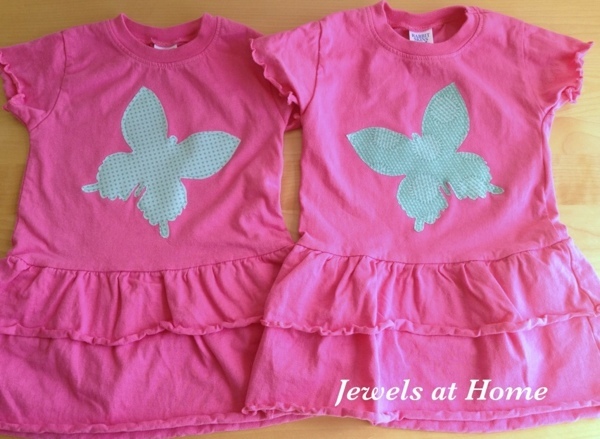 And for my twin nieces, I made these butterfly dresses. Twins are just twice as cute, especially my nieces, and I love it when they are in coordinated but not perfect matched outfits. Add appliques to inexpensive blank dresses and shirts for a unique gift. 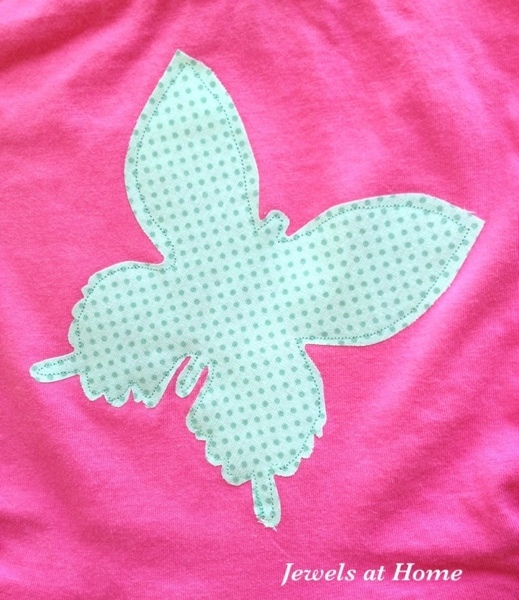 Close-up view of the butterfly applique for girls’ shirts and dresses. I drew all the designs freehand, and the details on how to make the appliques can be found in the post for the Onesie Decorating Party. While the girl appliques here turned out very feminine, I tried to make the others more neutral. It’s so challenging to find things that are truly gender-neutral these days, and with our house full of boys, I get a little tired of all the footballs and race cars sometimes. When I was growing up, it seemed like a lot more girls wore blue – it was my favorite color! Today, it feels like every color and every animal has been divided up between the genders, and there is very little overlap. I was talking about this with my friend Ari, remarking on how odd it is that cats are always for girls, giraffes are always gender-neutral, and dogs are always for boys… except for the poodles, she said. So true! Social conventions can be so odd, and I realize this is the least of it!